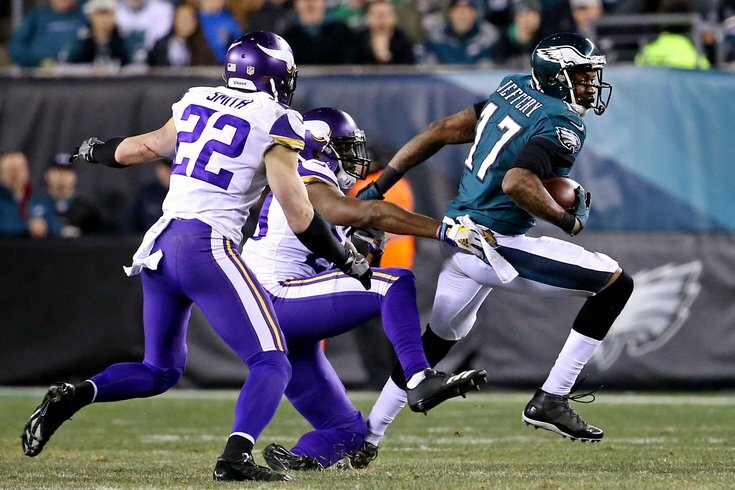 The Eagles will need Alshon Jeffery to make plays, even if he's covered all day by Xavier Rhodes. Before the 2018 NFL season began, the Philadelphia Eagles' matchup against the Minnesota Vikings looked like a blockbuster event. Instead, it has turned into something of a survival game for each team, probably more so for the 1-2-1 Vikes, who play in a more talented division than the 2-2 Birds. The Eagles embarrassed the Vikings in the NFC Championship Game last January, though the Vikings will come into Philly this time a around looking somewhat different. Offensively, they have Dalvin Cook back from injury, and of course, they backed up the Brinks truck for Kirk Cousins this offseason. Defensively, they've been without star pass rusher Everson Griffen, who is dealing with personal issues. So far this season, the Vikings are passing the ball on 73.5 percent of their plays, which leads the NFL. They are rushing for 63 yards per game, which is dead last in the NFL. That is not their typical identity. "I think it's a little easy to get deceived with the run game with them being 32 in the NFL right now," said Jim Schwartz. "They have a defensive coach. He's not going to stand for that very long. They want to establish the run. It's our job to keep them from doing that and keep big plays off the board." The Vikings have Dalvin Cook back this season, who showed that he was an explosive runner and a good receiver out of the backfield in four games last season, when he had 74 rushes for 354 yards (4.8 YPC) and 2 TDs before tearing his ACL. This season, while dealing with a nagging hamstring injury, Cook has not been very effective. He has 36 carries for 98 yards (2.7 YPC) and no TDs. He did not practice on Wednesday. Yes, the Eagles' most pressing issue right now defensively is their secondary, however, they have to be careful not to over-correct. First and foremost, the Eagles want to stop the run, make the opposing offense one-dimensional, and then get after the passer. They have been able to do that extremely effectively at home. If you're an opposing offensive coordinator, you would have to be crazy to not take several shots per game in the direction of Jalen Mills, the embattled Eagles' corner. But it hasn't just been Mills who has struggled. After a good Week 1, Ronald Darby has had issues of his own, and the safety spot vacated by Rodney McLeod proved to be disastrous in Sunday's loss to the Tennessee Titans. Even more impressively, Thielen has 25 first downs on his own this season. By comparison, Eagles wide receivers have 21 first downs, combined. In the NFC Championship Game last season, the Eagles had an answer for Thielen and Diggs, as they combined for 11 catches for 98 yards on 21 targets. Surely the Eagles would sign up for that on Sunday in a heartbeat. The Eagles don't plan on changing much, personnel-wise, in the secondary, or so says Schwartz. But certainly, they'll need a better game plan and execution than what they got in Tennessee against a less talented receiving corps. One way the Eagles can help out their secondary against guys like Thielen and Diggs is to get after Cousins. The Eagles only registered one sack in the NFC Championship Game, but they outright dominated the Vikings up front, pressuring Case Keenum into bad throws all game long. They also held the Vikings to 70 yards rushing on 18 carries (3.9 YPC). The Vikings' Achilles heel last season was their offensive line, and they didn't do much to improve it. This is a matchup the Eagles must not only win, but dominate. In the NFC Championship Game, Alshon Jeffery saw a lot of Xavier Rhodes, but as Schwartz has noted repeatedly, it's hard to have a corner follow a receiver for the entirety of a game without conceding some disadvantages elsewhere. Jeffery scored twice against the Vikings, with both scores coming against players other than Rhodes. The Eagles can still target Jeffery when Rhodes is playing on him. In the NFC title game, Nick Foles targeted Jeffery with Rhodes on him three times, and was 3-for-3. Doug Pederson expects that Jeffery will see a lot of Rhodes once again. "We know Rhodes is a top corner," he said. "A lot of respect for his game and the physical nature of his game. Probably anticipate him being with Alshon most of the day." Last year in the lead-up to the NFCCG, we cut up video of every Jeffery target vs. Rhodes, seeing as Jeffery formerly played in the same division as Rhodes when he was with the Chicago Bears. If you watch the video, it's certainly not as if Rhodes owned Jeffery, or vice versa. There are plenty of examples of Jeffery getting reasonably open, but his quarterback did not have good placement or timing on the throw. He won some and lost some. Rhodes is a top five corner in the NFL, but it's not as if the Eagles will shy away from him, nor should they. With the Eagles' No. 2 and No. 4 receivers still down, they need Jeffery to win against Rhodes. In the Eagles' loss to the Titans, Tennessee was able to get pressure on Carson Wentz throughout the afternoon, particularly with fortunately-timed, well-executed blitzes. Like the Titans, the Vikings rely quite a bit on the blitz, though the Eagles have seen it all from the Vikings before. "Well, structurally they're the same; schematically they're the same," Pederson said. "It's an aggressive defense. I really like these backers, the three they have and really the two that play all-time, Barr and Kendricks, I mean they don't ever come off the field. I have a lot of respect for their safeties. They're aggressive, downhill guys. "I think where the biggest challenge comes is a little bit up front. If their stud defensive end misses another game, then obviously that might impact a little bit. But they've got some guys -- if you just put on the film, they've got guys that can get after the passer. "But it's a scheme that is very similar to what we saw really the last two years. They're going to know us; we're going to know them. It just comes down to matchups and winning those and who can out execute the other team." In the NFC Championship Game, the Eagles gave Foles great protection all day long, but clearly, the offensive line is not playing at the same level they were in the playoffs last year, especially in blitz pickup, which Jason Kelce acknowledged. "There's three aspects really of picking up the blitz," Kelce explained. "One, being in the correct situation. Two, communicating it. And three, everybody executing it. I think if you look back at that game, we did not handle any of those three facets well."